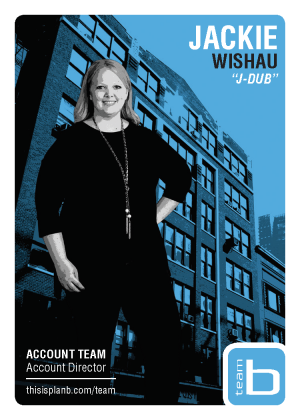 Before joining Plan B, Jackie spent seven years at CBD Marketing in Chicago, collecting a trophy case worth of awards along the way. Working her way up from intern to Account Director, she facilitated the development of corporate websites, large-scale data migrations, and new product launches, among other initiatives, for clients like Firestone Building Products, Whirlpool Corporation, and Illinois Student Assistance Commission accounts. From planning to execution and everything in between, Jackie was an ever-present source of strategic support, establishing herself as a true partner and an extension of her clients’ teams. Competitive by nature with a passion for problem solving, Jackie approaches every challenge as an opportunity to provide real strategic value, unfazed by demanding clients and unafraid of having tough conversations that move the business forward. “If you aren’t learning, you aren’t growing”, she constantly tells herself. And by striving to see the big picture and to learn her client’s business as well as they do, it’s clear that Jackie is growing into her role more and more every day. Jackie’s curiosity and love of the unknown extend far beyond the office. She’s an avid traveler, dating back to a college semester in Spain, and she’s made it a point to explore a new place each year. Abroad or at home, she enjoys the simple pleasures of good food and wine, a well-taken photograph, and the company of family dogs Henry, Stanley, and Luna on visits home to Libertyville, IL. Jackie is a graduate of Butler University, with degrees in Integrated Communications and Spanish.